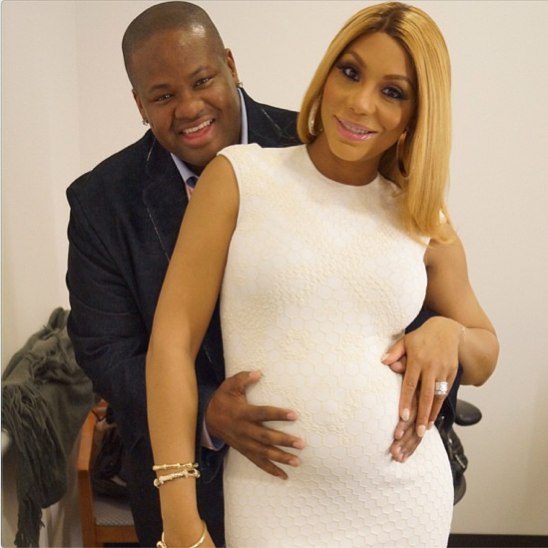 Tamar and Vince have finally confirmed rumors that Ms. Tamar is indeed pregnant! The happy successful and couple are expecting their first little bundle of joy together. Tamar confirmed the news while this morning while appearing on ABC’s Good Morning America with her sister’s. Check out the clip. I bet you 10 million dollars Tamar’s over the top personality will change after she has that child. Most women always seem to become a little bit more grounded and humble after bringing another life in the world. It’s something about being a mother that always does the trick. Congrats to the couple and the rest of the Braxton family in their upcoming new addition to the family….. This entry was posted in REALITY SHOW and tagged EVELYN BRAXTON, TAMAR BRAXTON, TONI BRAXTON, TOWANDA BRAXTON, TRACI BRAXTON, TRINA BRAXTON. Bookmark the permalink. ANNOUNCEMENT: A SPECIAL MESSAGE FROM MABEL "MADEA" SIMMONS! SAY WORD! FOX'S NEW TALK SHOW 'THE REAL' PULLS IN HUGE RATINGS! SAY WHAAT! THE GAME ANNOUNCES & EXPOSES 50 CENT AS A GHEY "DOWN LOW" RAPPER!! VIDEO PREMIERE: R&B BEAUTY MYA GETS SOAKING WET FOR "MR. INCREDIBLE"! SAY WHAAT! ON-AIR PERSONALITY "BIG TIGGER" FIRED FROM WASHINGTON DC'S WPGC RADIO STATION!